The good news is all this talk is going to encourage the TV manufacturers to simply panic ….. In fact, Gene is so sure an Apple TV is coming that he told anyone in the audience who is thinking of buying a TV to wait, because Apple’s is going to be awesome. The magic of Apple’s TV, Gene says, will be seamless integration with your other Apple devices and service. The TV will come with a standard remote, but you’ll also be able to control it with your iPhone or iPad or via Siri. You’ll also be able to download console and other games, content, etc., from iTunes, the App Store, and iCloud. You’ll still have to have a cable subscription and cable box, Gene says, because Apple doesn’t have enough content otherwise. But the only thing you’ll have to do is screw the co-ax cable into the back of the TV set. Gene thinks Apple will launch its TVs for the holiday season next year. That’s what our assumption has been as well. With the primaries and caucuses quickly approaching, former House Speaker Newt Gingrich continues to demonstrate his surging popularity in several early primary states. In the latest Insider Advantage poll of likely Florida Republican presidential primary voters, Gingrich pulled in 41 percent of the votes to finish in first place. Gingrich defeated former Massachusetts Governor Mitt Romney by 24 percentage points. While Romney garnered 17 percent of the votes, pizza magnate Herman Cain earned 13 percent of the votes to take third place. Texas Governor Rick Perry finished in fourth place with 7 percent of the votes. Gingrich won the latest Insider Advantage polls of likely Iowa Republican presidential caucusgoers and likely South Carolina Republican presidential primary voters Tuesday. In the Iowa poll, Gingrich garnered 28 percent of the votes, placing the Georgia businessman 15 percentage points ahead of Texas Congressman Ron Paul. In the South Carolina poll, Gingrich pulled in 38 percent of the votes, placing the former House speaker 23 percentage points ahead of Romney. According to Real Clear Politics, Gingrich leads by an average of 8.2 points in Iowa polls and by an average of 8.6 points in South Carolina polls. Given that the first caucus is in Iowa on January 3, followed by the New Hampshire and South Carolina primaries, Gingrich is likely to win two out of the first three major competitions of the 2012 presidential race. The rebound in U.S. nonfarm productivity growth was not as strong as previously estimated in the third quarter, while wages declined for two straight quarters, supporting the Federal Reserve’s views of moderate inflation pressures. Productivity increased at a 2.3 percent annual rate, the Labor Department said on Wednesday, a downward revision to its previous estimate of 3.1 percent. Economists polled by Reuters had forecast productivity, which measures hourly output per worker, being revised down to a 2.6 percent growth rate. The revision reflects a much slower gross domestic product growth pace during the July-September period. Productivity fell at a 0.1 percent pace in the second quarter. Compared to the third quarter of last year, productivity increased 0.9 percent instead of 1.1 percent. The government last week cut its third-quarter GDP growth estimates to 2.0 percent from 2.5 percent. Though productivity has slowed after growing rapidly as the economy emerged from the 2007-09 recession, businesses have maintained the bulk of the gains made during the recovery. Hmmm, maybe the economy never came out of the Recession? Two months after it began, the movement is giving every sign of running out of steam. Recent protests have been resounding flops, public support is slipping, and even Democrats are reluctant to embrace the movement. Despite all their high tech swagger …. Black Friday Protest. Occupy Black Friday planned to dampen sales at publicly traded retailers on the biggest shopping day of the year to “hit corporations that corrupt and control American politics where it hurts.” It was a bust. Just four showed up that morning at a New York City Macy’s, for example, and only two dozen protested at downtown San Francisco stores. Meanwhile, Black Friday sales climbed 7% to a record high and the S&P Retail Index on Monday had its best one-day percentage gain since August. UC Davis Strike. Occupiers promised a general strike at the University of California-Davis Monday to protest tuition hikes, with the goal of shutting down the campus. The strike never happened, and classes went on as scheduled. Shutting Wall Street. Movement organizers planned a massive “street carnival” on its two-month anniversary Nov. 17, promising at least 10,000 would attend and “shut down Wall Street.” Only about 1,000 showed up and Wall Street business went on as usual. Other “day of action” events around the country attracted only a small number of protesters. Student Debt Campaign. The Occupy Student Debt campaign is trying to enlist one million people to default on their student loans to protest the rising cost of colleges. So far, just over 1,700 have signed the online pledge, according to its website. With city governments clearing out many Occupy camps, including Occupy LA early Wednesday morning, it’s now unclear if the movement will have any meaningful presence at all in the near future. You think the media was any friendlier to R. Reagan than today? Think again … Reagan was too controversial, too extreme, way to conservative to ever get elected President. And if that wasn’t enough, Reagan would drop nukes on the old Soviet empire. And in the end, the real election results were so bad for Carter that he folded early. One of the enduring truisms of American politics has been that an incumbent President wields all but overwhelming political power. This axiom holds that almost any challenge to a President has only the barest chance of succeeding. But this pattern may be changing. In the case of Jimmy Carter, his incumbency—and the fact that he is thus blamed for every national problem—may be his biggest electoral handicap. Carter lost not by a few points, but by a landslide. Two weeks out, the polls favored Carter, 47-39. Reagan’s landslide challenges the pulse-taker profession. For weeks before the presidential election, the gurus of public opinion polling were nearly unanimous in their findings. In survey after survey, they agreed that the coming choice between President Jimmy Carter and Challenger Ronald Reagan was “too close to call.” A few points at most, they said, separated the two major contenders. But when the votes were counted, the former California Governor had defeated Carter by a margin of 51% to 41% in the popular vote – a rout for a U.S. presidential race. In the electoral college, the Reagan victory was a 10-to-l avalanche that left the President holding only six states and the District of Columbia. After being so right for so long about presidential elections – the pollsters’ findings had closely agreed with the voting results for most of the past 30 years -how could the surveys have been so wrong? The question is far more than technical. The spreading use of polls by the press and television has an important, if unmeasurable, effect on how voters perceive the candidates and the campaign, creating a kind of synergistic effect: the more a candidate rises in the polls, the more voters seem to take him seriously. According to yesterday’s Gallup poll, Obama trails Carter by 9, at the same point in their terms of office. China’s new aircraft carrier, the refurbished Soviet Varyag, has been rechristened the Shi Lang and took another cruise Tuesday. 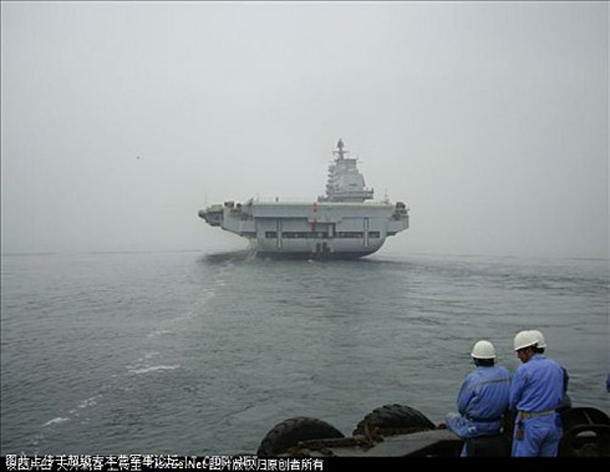 DefenseTech blog put up the following photos showing the carrier as it makes its second voyage, though this one unaccompanied by the numerous tugs from its August debut (via Alert 5). DefenseTech points out the absence of a wake, and that in the following shot a tow-line is visible from her stern. The comments at DefenseTech offer a glimpse into various ideas and considerations about the carrier’s potential. On the domestic front, last night Fitch lowered its U.S. credit outlook to negative, blaming the Super Committee’s failure to agree on a plan to reduce the budget deficit by $1.2 trillion. The negative outlook implies a 50% chance of a downgrade within two years. Haha, Obama reelection strategy gets expensive for the USA. You are currently browsing the Tarpon's Swamp blog archives for November, 2011.